As you know if you follow my blog, a HUGE part of my journey with Thirty One is to help others. Sometimes it is a fundraising project, or a donation to an event or giving to someone who was just in need of some loving. It doesn’t matter whether it’s a small goal or a HUGE goal, I want to help. As a result, I have been able to donate to various causes throughout the years. For Easter, we donated 25 Easter Baskets to Dottie’s House. Dottie’s House is a transitional housing facility designed to aid women and children who have survived domestic violence. They proactively help these families develop the life skills needed to become self-sufficient for their future financial and emotional independence. While delivering them, I was sharing stories of my days as a Social Worker with the South Jersey AIDS Alliance when SMACK! Mother’s Day was quickly approaching and I wanted these moms to feel some love. So, again with the help of my family, friends and customers, we are putting together “pampering bags” as Mother’s Day Gifts for these ladies. The goal is 18 since there are 18 units at Dottie’s House. So far we are halfway there. 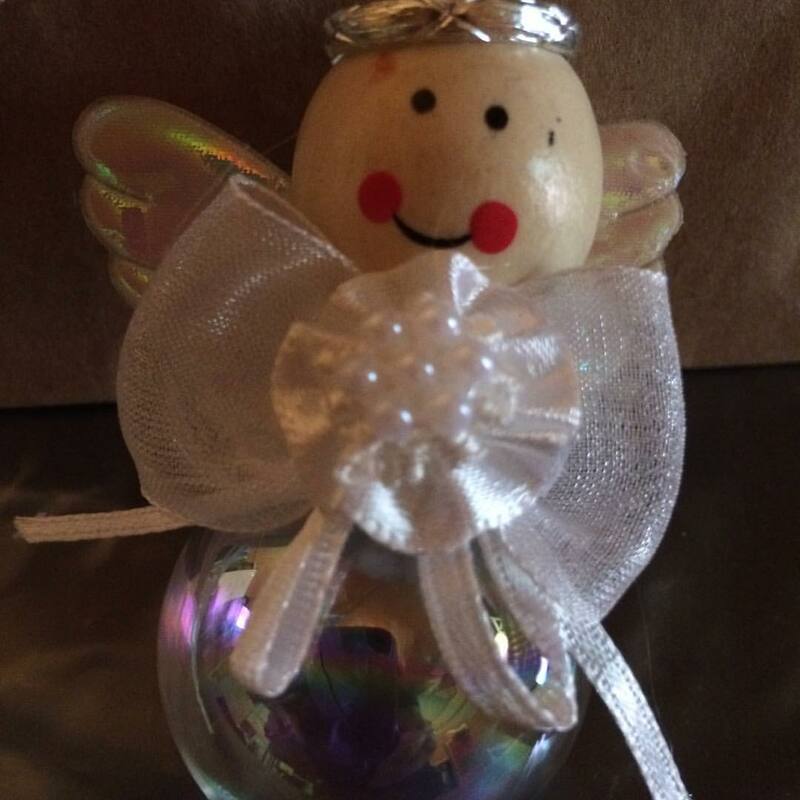 In addition, I am selling Domestic Violence Angel Awareness magnets for $5 with the proceeds being donated to Dottie’s House. Since I began my “give back program”, almost $10,000 in products and cash donations have been made to various causes. It fills my cup to know we have made the difference in the lives of so many people. So, who is with me? 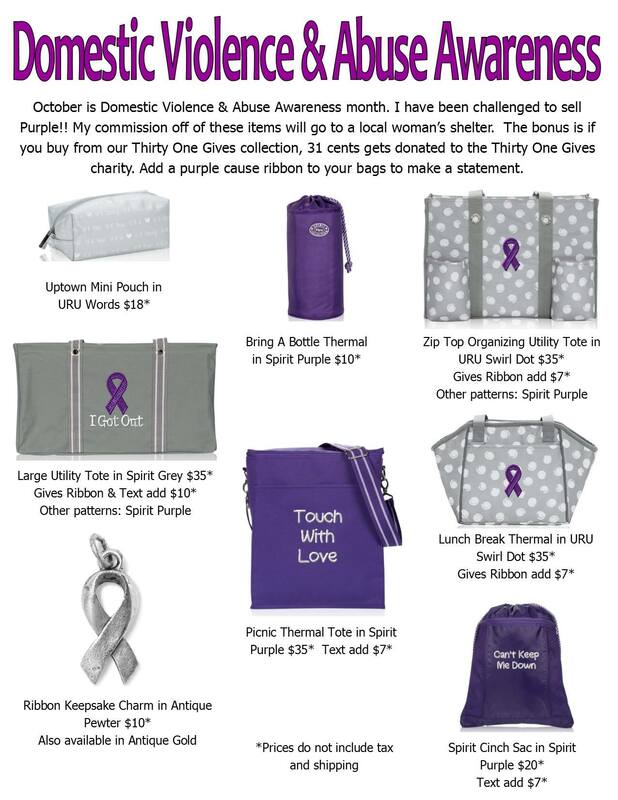 For $20 you can bring a smile to a mom who is a survivor of domestic violence. The cut-off is April 20th so the bags will arrive in time to be stuffed and delivered on May 9th. This project is near and dear to my heart. It is a tribute to the women I know who have escaped and survived domestic violence. October is almost here and I love sharing new party ideas. Themed home parties are so much fun. It is easy for the hostess and I am able to help her keep things simple. How about a Football Wives party? I am football fanatic but what a great way to pass the time for those who are not into football (or hockey). I told my hubby just the other day, he got me hooked on football and now I am the one yelling at the TV during football games. We have some NEW Fall prints which will give you a chance to shop for the men in your life so they can sport their favorite team’s colors. Fundraiser Party – October is Breast Cancer Awareness and Domestic Violence Awareness Month. Why not support your favorite cause at the same time guests are doing their shopping? I will donate 25% of all sales to your organization or cause. Encourage guests to bring their gently used bags to be donated to a local shelter and I will give them a discount on their new purchase. A win-win for everyone. Halloween Party – Do you like Halloween? Challenge your guests to come in costume and earn a gift. Trick or Treat bags from me. Serve apple cider,pumpkin pie or candy apples. Brunch – Nights too busy? Busy moms would love a moment in between dropping the kids off and the next errand to grab a bagel or donuts, and a fresh cup of coffee or tea. This is can be done as an Open House but for a shorter period of time. It solves so many concerns – no time, what to serve & keep things short and sweet. A great way to spend a Saturday or Sunday morning or that week day morning when the kids are at school. Men’s Only Party – Invite the men for an afternoon of football, pizza, soda (or beer) and Thirty-One. Set up a display and let them shop for Christmas presents during halftime, tell them that when they place a $35 (or whatever) order, I’ll wrap the gift for them. I will help you gather a wish list from your friends (their wives/girlfriends) to make the shopping easy. What are some of YOUR favorite October party themes? Share them with us. Better yet, when you have one, take a picture and post it here so we can all see the fun! Have a Thirty One-derful day! To Beth it was the confusion of an inept airline. To me, it was a divine appointment from God. “I don’t have an assigned seat,” the disheveled young woman complained as she stumbled into the airplane. “This one is empty,” I pointed out. “Thanks,” she huffed as she plopped down. The beautiful young lady was obviously exhausted. She was dressed in skin-tight jeans and a distracting low-cut T-shirt. Her flip-flops slid under her feet to reveal a tattoo on the top of her foot. Sunglasses hid something…I wasn’t sure what. She looked straight ahead, but I felt that her mind was traveling to a distant place. After the plane left the ground, I pulled out a book I had written to prepare for an upcoming radio interview. Put the book down and talk to this girl, God seemed to say. God, she doesn’t want to talk. I can tell by her body language. She’s not interested in conversation, I mentally argued. I closed the book and turned to this…kid. “So, where are you headed?” I asked. “Were you in Florida on business or pleasure?” I continued. “I was visiting my boyfriend,” she answered. For the next hour and 90 minutes, this young girl poured out her heart. She had been abandoned by her birth father and sexually abused by several men in her life. She was on this flight home because her boyfriend, who had just come out of a drug rehabilitation center, had “roughed her up.” Actually, she was fleeing. My heart broke as this beautiful young girl told me story after story of cruelties that had been doneto her mingled with bad choices that had been made through her. At the moment, her life resembled a 100-car train wreck with one lone survivor who was in desperate need of life resuscitation. As my mind engaged with Beth (not her real name), my spirit communed with God. What do I do? I prayed. So much hurt. So much pain. I held Beth’s hand and God’s sorrow for this girl filled my heart. It wasn’t just a “God bless Beth,” sort of prayer. I sobbed. It was as if God’s pain for this girl I didn’t even know was flowing through me. As God would have it, Beth and I were in the front row of a very sparsely filled plane. The only person paying any attention to us was the flight attendant who sat facing us in her jump seat. I’m not sure, but I think God was working in her heart as well. Well, I’m no angel, that’s for sure. But I believe the angels were hovering around us in that plane. One of the great mysteries of the Christian life is that God has given us great power through prayer. Through the pages of the Bible and the volumes of history, we see God mightily working on behalf of those who seek Him through prayer. All through our lives, there will be times when we feel powerless. But friend, we are never more powerful than when we use our words in prayer. I was only with Beth a few hours in that airplane, but God’s power was evident when we grasped hands and prayed. His transforming power did more in a few moments than any human could have done in years. So keep your eyes open. You could be someone’s miracle today. Thank you to Girlfriends in God and Sharon Jaynes for today’s blog. Domestic violence and abuse can happen to anyone, regardless of gender, race, ethnicity, sexual orientation, income, or other factors. Did you know that 1 in 4 women will experience domestic violence during her lifetime? Did you know that most acts of domestic violence take place between 6 pm and 6 am? Did you know that more than 60% of the incidents of domestic violence happen at home. You may wonder why women (and men) would stay around. You may wonder how could anyone put up with the verbal or worse physical abuse from someone that says that they love them. Victims believe that they are to blame. That if the hadn’t done XYZ, then their significant other wouldn’t have had to yell or hit them. The truth is that NO victim is to blame for any occurrence of domestic abuse or violence. More than 3 million children witness domestic violence in their homes every year. Children who live in homes where there is domestic violence also suffer abuse or neglect at high rates (30% to 60%). Children exposed to domestic violence at home are more likely to have health problems, including becoming sick more often, having frequent headaches or stomachaches, and being more tired and lethargic. Children are more likely to intervene when they witness severe violence against a parent – which can place a child at great risk for injury or even death. Children are the silent victims. I was one of those children. Middle class family with two parents. By all appearances happy and successful. But alcohol addiction created a monster that lead us being one of the stats. I was the child that watched the abuse. I was one of those children who tried to intervene. The memories live on and haunt me as an adult. Forgiveness has lead to healing but the memories linger. Do I think that witnessing those acts of violence affected me – YES! I was a victim of verbal abuse for many years. I struggled with relationships. I struggled with self esteem and confidence. I struggled with addictions. Children learn by example. Remember the line “Do as I say, not as I do”. Well, chances are children who have been exposed to domestic violence will subject themselves to the same kind of treatment. #1 FACT: Most domestic violence incidents are never reported. Help change the facts. Speak up, speak out, and make a difference for victims of domestic violence.